Lake Bunyonyi “the place of many little birds”, was formed 10,000 years ago when a river was dammed by lava and slowly made a water body 25km long and 7km wide, the biggest in southwestern Uganda. It is one of the most beautiful and safest lakes in Africa as it has no hippos or crocodiles. Lake Bunyonyi is 44m deep and has 29 islands. Most tourists on safaris in Uganda come here to relax and chill out after a day or two of Gorilla tracking, Volcano climbing, or being for days on the Safari trail in Uganda. A Dugout Canoe Safari on Scenic Lake Bunyonyi. A dug out canoe safari Uganda is an unforgettable idyllic journey on Lake Bunyonyi, offering you Island Hopping, Exploration, Birding, Village Visits according to your choice. It will offer you chance to discover the lake especially some of its 29 islands, the Rutinda Market, the people that live here all in an ancient like dugout canoe. 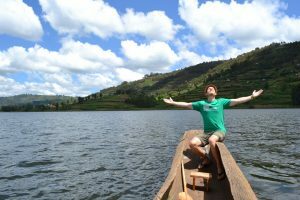 While paddling or being paddled on Lake Bunyonyi you do not have to worry about Hippos and Crocodiles, they are not here on this pristine and scenic lake where everything travels by dugout canoes to the islands, including people, produce, meat, sodas and beer. Where even the school bus is a dugout canoe, still made in the ancient ways of old. You will meet the people who live on the islands and create new friendship, discover Islands with tales of their own such as the Akampene Prison Island and others. Spend a relaxing day at the “Place of Little Birds” paddling a dugout canoe in the same way as it has been done for hundreds of years here and along other lakes such as Lake Victoria in Uganda. In a world of much activity and noise, a day away from it all with have you listen to only sounds of birds, and the paddles dipping into the water. If you are interested in a Dugout Canoe Safari on Scenic Lake Bunyonyi – please contact us.